As many know, Hungry Mother State Park is my favorite place in Southwest Virginia. I’m pretty sure I have been on every trail there, as well as kayaked across the entire lake, and on occasion have rented their cabins. Not to mention the many times I’ve written about it and shared pictures. When it is 75 degrees, sunny with a cool breeze and low humidity – it seems pretty natural that a hike is in order, especially since my body is in pretty good shape (at the moment). And, since it is only an hour away. 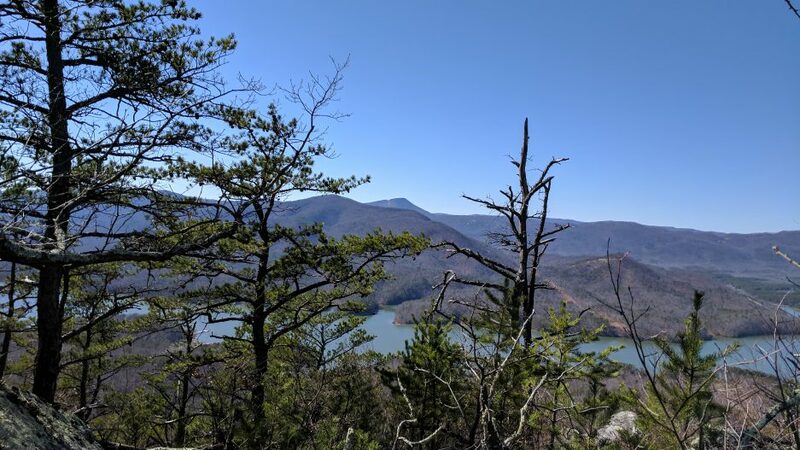 . .
We hiked about 8 miles – including going to Molly’s Knob which I have only done once before because it is kind of steep. But we made it. . .
And there were some very nice people up there who offered to take our picture. We ended up walking much further than we had planned, mostly because it was a beautiful day and we had nothing to do that couldn’t wait until tomorrow. While uphill takes the wind out of me, downhill can be downright painful, so I slipped on my knee brace before heading down to the lake level. As we were about to cross the dam on the way back to our parking lot, we were treated to this lovely site of a mother duck and her babies. Such a great park! Do you have a favorite place that you like to visit frequently? It’s probably been more than 30 years since I’ve been to HM. This post makes me realize that I need to go back. That surprises me – you need to go! I agree that while uphill ascents can be quite tough, descending can also very difficult. I am always very concerned about falls, ankle injuries, popped knees, etc on a descent. Good for you about keeping your knee safe to avoid any potential problem. We live and learn Joanne. How wonderful you were able to visit your Happy Place! Stay well & happy hiking!